PDC world champion Gary Anderson will start the defence of his title against Denmark's Per Laursen or Andy Boulton. 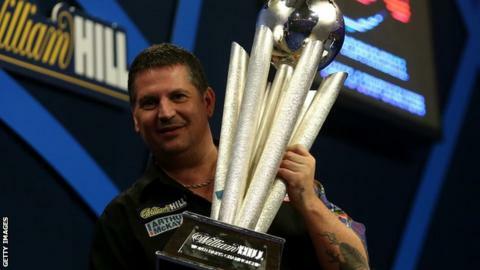 The 44-year-old Scot beat 16-time world champion Phil Taylor 7-6 in a thrilling final in January. Taylor will play Japan's Keita Ono or Filipino Alex Tagarao in the first round, while world number one Michael van Gerwen has been drawn against Thanawat Gaweenuntawong or Rene Eidams. A field of 72 players will compete for £1.5m in prize money from 17 December. Boulton, ranked 73 in the world, was runner-up in Monday's PDPA Qualifier in Coventry meaning he will face Laursen in the preliminary round at Alexandra Palace. Ricky Evans, who beat Boulton in the final at the Ricoh Arena, goes straight into the first round to play Australian Simon Whitlock. Paul Lim, the first player to hit a nine-dart finish in the BDO World Championships - in 1990, will play Russia's Aleksandr Oreshkin in the preliminary round with the winner facing Mervyn King. Elsewhere, five-time world champion Raymond van Barneveld meets fellow Dutchman Dirk van Duijvenbode, world number four Peter Wright will play former world youth champion Keegan Brown and Adrian Lewis, champion in 2011 and 2012, will take on Jan Dekker. The final takes place on 3 January.